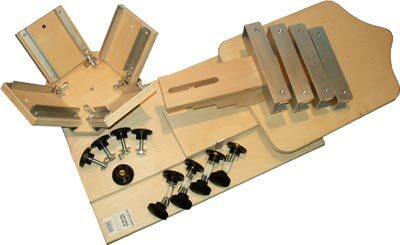 The following information details how to assemble both a single arm [SPJ-SK] & 4 arm [SPJ-4SK] screen printing jig ready for use. Each jig is hand made with all screws tightened using a set tension, however during shipping [and under high volume use] some screws may loosen slightly and require tightening to ensure the jigs alignment remains true. Use a handheld screwdriver, not a power drill, to check the 3 screws that hold the clamp to the arm in the arm and the 6 screws which hold the arm base to the rotating board in the 4 arm jig [the arm to the base in the single arm jig]. 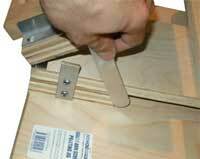 NB: Jigs may be supplied part assembled with some components already in place i.e. arm clamp screws inserted or rotating arm spindle attached to base. 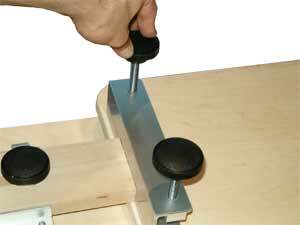 Jigs differ in operation between models and functions - this information is designed for the NEHOC Single & 4 Arm Screen Printing Jigs. If your jig does not have adjustable arms, a rotating base or other functions then you may be required to move your item to a different location on the board before fine tuning any registration in the arm [this applies when using Jig Hinges]. 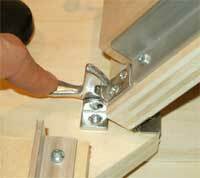 This step is only required for 4 arm jigs - single arm jigs proceed to step 2. IMPORTANT: When using the jig in multi-colour operation this knob should NOT be tight, otherwise the rotating base is unable to rotate. Attach the arm as indicated below - the same process is used for single & 4 arm jigs. Repeat the above process for all remaining arms when assembling a 4 arm jig. Place a clamp screw into the top of the clamp and turn clockwise to engage the thread and begin insertion into the clamp. Repeat for the other side. Screw all the way down to fully engage the thread and clear any residue remaining from manufacture. When screwing frames into the jig, use Jig Height Adjustors [or similar plastic] to cover the ends of the clamp screws and protect frames from compression caused by over tightening. Between prints the arms must be raised for a number of reasons, most importantly being so you can remove the print and place a new item. In addition this saves space and also enables faster printing by enabling you to keep the squeegee rested on the screen [standing upright against the clamp] so the ink remains in the frame. The jig contains an inbuilt feature to hold each arm up after printing, this is the Arm Holder Clip - pictured left. After printing raise the arm and the clip will hold the arm up, when ready to print simply depress the clip to release the arm. This feature ensures multiple screens are raised to reduce the space required when rotating the jig and also enables you to keep the squeegee within the frame between prints [rather than having to place on another surface and drip ink]. The single arm jig also contains an inbuilt feature to hold each arm up after printing, this is the Arm Holder Bar, located on the left side of the arm. As pictured right, after printing raise the arm and the bar will lower to hold against the base board. When ready to print simply pull the arm forward to release the arm. The printing process is the same as normal, however for information and a few tips on using jigs please see the FAQ on Screen Printing Jigs - click here . . Details on Screen Printing Technique - click here . .
Video on Screen Printing Technique - click here . .